I love to ride my bike. I commute every day, I’ve raced for years (and won) and so for me and a core group at Mayer/Reed every month is Bike Commute Challenge month. That’s just how we roll. Sure, we do the official challenge, but I mainly use it as opportunity to send an unsolicited and over-the-top email about the virtues of cycling. That gentle reminder and a promise of cookies usually gets a few of the less inclined to pump up the old tires. And so out march all of the bikes with their proud owners. Some of us have carbon fiber bikes, others ride electric bikes or bikes with warn-out knobby tires. Other bikes are retro classic racers and there is one much-beloved yard sale “gem.” All the different bikes at Mayer/Reed underscore the different personalities that play through the firm in a magically cohesive way. Cycling is also a terrific way to see our city and region. I think it is the best way actually. 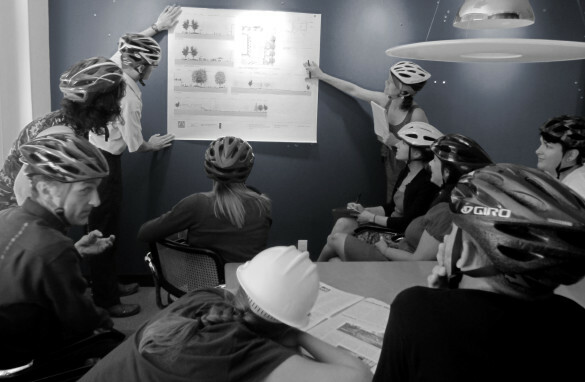 Each of us at Mayer/Reed takes great personal pride in our work and cycling is a wonderful way to keep tabs our projects. This isn’t just during construction mind you—we are invested for the long haul. For this reason many of us find cycling is the best way to go. That is just how we roll. 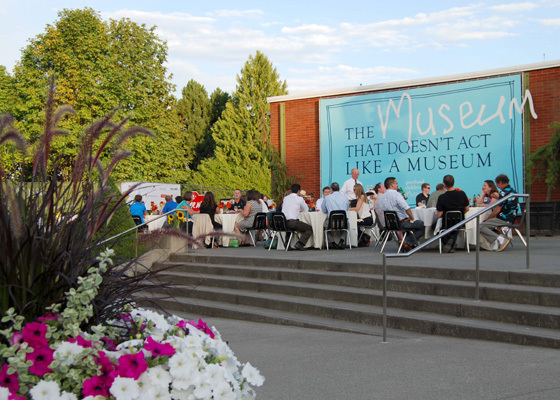 On August 7, members of the community, Portland Children’s Museum and consulting/construction team gathered to “think like a kid again,” while raising money for the Architecture Foundation of Oregon (AFO). Mayer/Reed, Hennebery Eddy Architects and Andersen Construction hosted a picnic and hardhat tour of the new Outdoor Adventure underway at the museum. Sponsored as part of the Dinner with an Architect program, the event contributed to AFO’s mission to create awareness of our designed environments. Mayer/Reed’s design for the Outdoor Adventure was inspired by Richard Louv’s book, Last Child in the Woods. 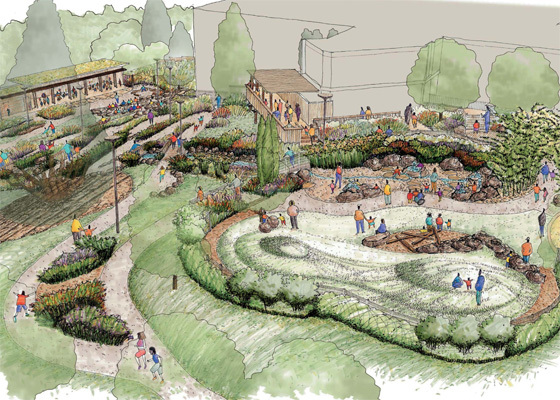 It will reconnect children and their families with nature and learning through active, engaging, outdoor experiences. The wooded hillside will feature a rocky streambed, splash puddles, bridges, trails, sand pit, hide-outs, plant thickets and hut-building areas for kids to explore. Hennebery Eddy Architects’ timber shelter provides a flexible location for special events, camp-outs and art projects. Thank you to the Portland Children’s Museum, donors and skilled craftsman working on behalf of the project. We look forward to its opening on Earth Day, 2014! 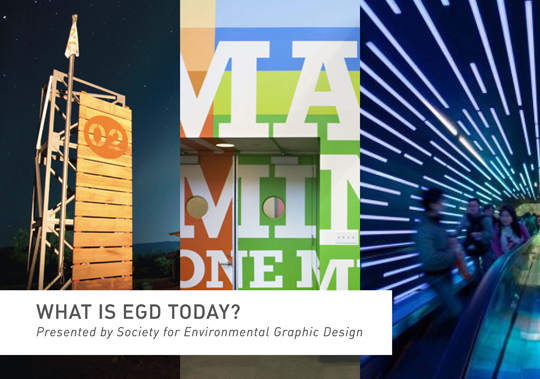 Design Week Portland Presentation: What is EGD today? Join us during Design Week Portland for a presentation featuring a retrospective of environmental graphic design (EGD) including prominent designers and projects. EGD embraces many design disciplines including graphic, architecture, interior, landscape, and industrial design—all related to the visual aspects of wayfinding, communicating identity, and shaping the idea of place. Elizabeth Anderson and Mike Sauer, Anderson Krygier, Inc.